When I use GarageBand to record some audio, the audio files are too large (e.g. :1.86GB file size) and GarageBand won't export over 90 minutes long audio. Audacity cannot directly export to .mp3 file. I knew some people who recommended me Audacity to convert the audio files but I don't like to use this software. Any other suggestions on how to convert an audio file .aiff to .mp3? you could definitely use ffmpeg for this kind of job. ffmpeg is a huge framework dedicated to multimedia encoding. Once installed write down the above command line on your terminal, this should convert your mp3 to the default parameters of ffmpeg for mp3. I have to do these types of conversions often, mostly with huge batches. Easy drag and drop, detailed conversion settings, and also you can use it for free. 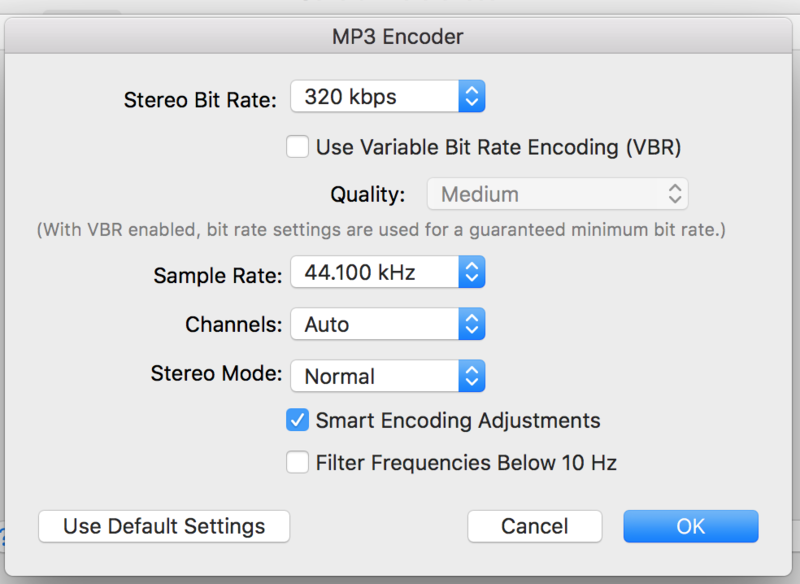 Since it's clear that you're using a Mac (since you're using Garageband), the easiest way to convert an aiff to mp3 would be through iTunes since it has a built in audio encoder. Once you open iTunes, click on the iTunes tab on the top left of the menu bar and open up the Preferences. You can also use the keyboard short to open up Preferences by holding down the open apple/command key (⌘) and pressing the comma key (,) at the same time. This keyboard shortcut is actually a very common keyboard short set to open up the preferences on a lot of different programs. Once the preferences are open, click on the General tab. Once you're in the general tab, click on "Import Settings...". After you open that it will look like the first image below. From there you can choose which audio encoder you want to use. 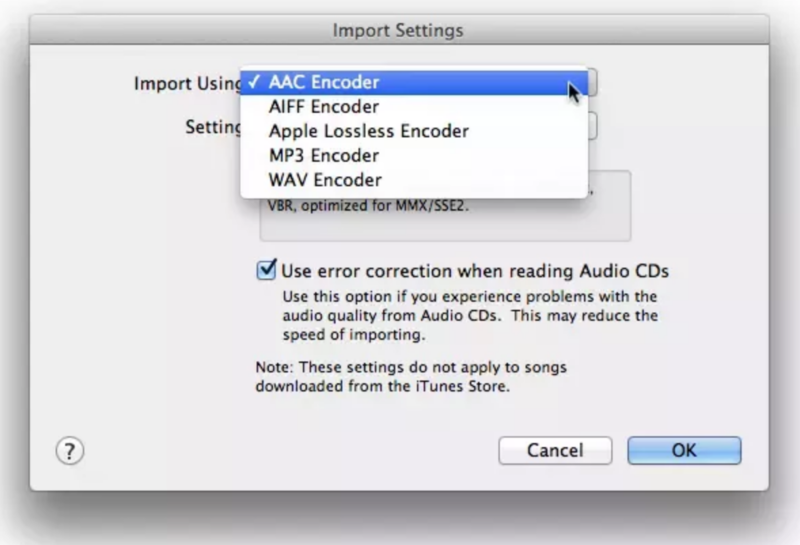 In this case, choose the Mp3 Encoder under the Import Using dropdown button. Since you're using mp3, I would recommend that you choose the "Custom..." option instead of any of the default quality settings because none of the defaults actually give you the best quality available for an mp3. Make sure to use the settings shown in the second image so that it will actually be the highest quality mp3 option available (320kbps bit rate, 44.100 kHz sample rate, Auto channels so that it will use the same channel settings as the file you're trying to convert). From here and depending on the version of iTunes you have you can either just right click/command or control click any files you add to your library and an option will show up saying something like "Create MP3 Version". If it doesn't show up when you do the click option then you have a newer version and it have moved to the menu bar under File > Convert > Create mp3 Version. And boom, you've successfully converted your file. Not the answer you're looking for? Browse other questions tagged mp3 garageband or ask your own question. How do I mass convert mp3 to an open format without losing quality? How to ensure uniform sound levels in multiple WAV files?